Twenty seven down. Twenty eight to go. Children have little patience for merely observing art. They instinctively want to interact and create. 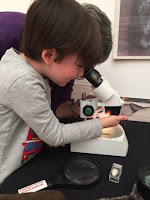 So it was that Ann Hamilton's exhibit at the Henry Art Gallery, titled the common SENSE, was a perfect fit with the gallery's annual Arty Party for kids. The "the common SENSE" refers to Aristotle's observation that touch is the sense common to all animal species. This very ambitious museum-wide exhibition was four years in the making. Working with the Henry, the artist conducted research at the gallery, the UW Library's Special Collections and the Burke Museum. The exhibit invited participants to submit writings and photographs, read, sing, and literally dive into the displays by tearing out sheets from newsprint pads printed with animal images. Held at the museum on a lovely Saturday afternoon, the Arty Party was full of opportunities for kids to experience the exhibit while expressing themselves on paper, in dance, and through design. There were stations to hear native stories and to learn from the Burke Museum about the sense of touch in the animal kingdom. For the older kids, an illustrator of superhero comics shared his art and creative process. The Northwest Film Forum presented several interesting animated short movies for kids. 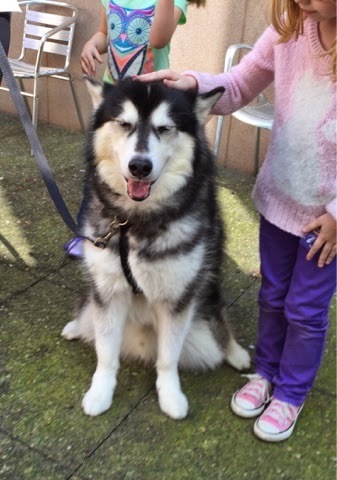 And Dubs, the UW Husky mascot, appeared live and in-person. The common SENSE exhibit demonstrated the Henry's belief that art is not a spectator sport. The first art museum in Washington, the gallery was founded in 1926 through a donation of art and money by Horace C. and Susan Henry. Today it is dedicated to contemporary art, and the common SENSE showcased the gallery's commitment to champion new work, bring leading artists to the region, collaborate with the UW and community partners, and connect audiences of all ages to contemporary artists and ideas. The gallery is currently featuring a wonderful photography exhibit supported by ArtsFund - llse Bing: Modern Photographer. Twenty six down. Twenty nine to go. 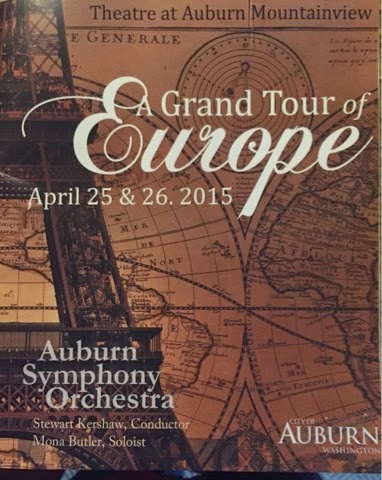 It is a bit of a drive from Seattle to Auburn, but it was well worth the trip to hear the Auburn Symphony Orchestra. It occurred to me that the reverse must be true for the thousands of folks who live in the valley and hills south of Renton: how fortunate to be able to enjoy an orchestra of this caliber without the drive into the city. The Sunday afternoon performance I saw was styled as “A Grand Tour of Europe” through territory the conductor knows well. The very appealing “tour” featured Austrian, Italian and French composers (Mozart, Vivaldi and Bizet) along with a work by English composer Edgar Elgar featuring principal bassoonist Mona Butler. The symphony will return to a beautifully renovated Auburn Performing Arts Center in downtown Auburn later this year for its 2015-16 season. At the concert Maestro Kershaw mentioned that the orchestra is particularly looking forward to a world premier next January of a work written for the orchestra by Daniel Ott, a local composer gaining international recognition as a rising star. Twenty five down. Thirty to go. 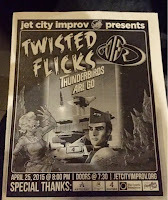 Jet City Improv's U District theater was packed on a recent Saturday night for a screening of the English sci-fi classic, Thunderbirds are Go. Before the show Jet City's cast members took written suggestions for themes and dialogue from the audience. Those ideas, shared with the audience in advance, informed the improvisational re-dubbing and involved the audience in the creative process. The first Twisted Flicks performance came on Halloween night in 1997, when improvisers re-dubbed the classic B-movie Creature From the Black Lagoon. 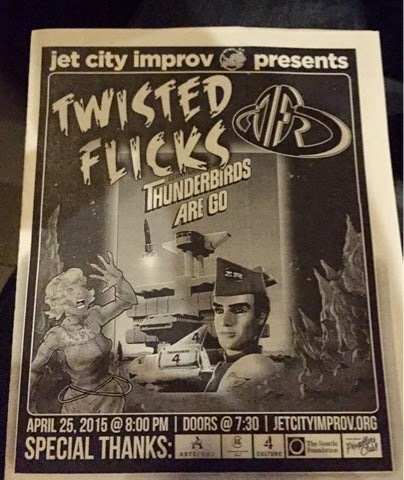 Although Thunderbirds is similarly dated and corny, the improv players show respect for the material. In the introduction they explained the marionette film technology used to make the movie and why it was innovative and "state of the art" in 1966. 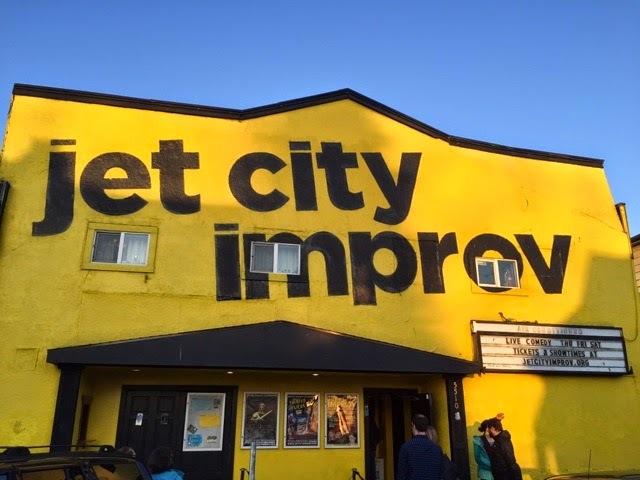 In its 22nd year, Jet City Improv is high-energy collision of talent, humor, innovation and commentary that is fresh and thought-provoking. It is all about fun; they never take themselves too seriously. In 2003, after years of performing in various Seattle venues, Jet City moved into its current home on the north end of the Ave in the University District. With control of an entire theater they were able to begin producing improvised plays (a series now referred to as Jet City Improv Presents) that cover everything from political satire to musicals, murder mysteries, and more. Jet City also has a 40-week improv training curriculum (known as the Jet City Improv Academy) as well as outreach programs that provide free performances and workshops to homeless and incarcerated youth in Seattle, and physically ill children around the state.